Membership is a process that best marks and maintains a believer’s commitment to life transformation, while working to insure the integrity, unity, and building up of the church. Thus, membership is more like discipleship than enlistment. It is more than simply being saved, but less than what a believer becomes in a lifetime of spiritual growth. Membership is not about an organization, but about the living organism of Christ’s Body. It is not about privilege, but about becoming more like Christ in the context of a local and worldwide community. “So then, just as you received Christ Jesus as Lord, continue to live in him, rooted and built up in him, strengthened in the faith as you were taught, and overflowing with thankfulness” (Colossians 2:6-7). 1. A United Brethren church member must have a professed personal relationship with Jesus Christ as Savior and Lord. 2. Membership includes a believer’s voluntary submission to a prescribed set of standards. In choosing to become a member, a Christian chooses to follow those expectations. 3. Doctrinal commitment is important to the unity and stability of church membership. 4. Mutual accountability is essential to the maturity of the church member. Believers who choose membership in a United Brethren church voluntarily accept being held accountable for their Christian faith and practice. The church’s expectations for its members are clearly stated and printed. 5. 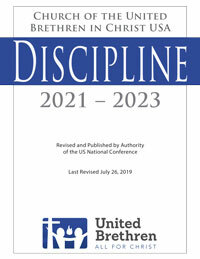 Church discipline is essential in preserving the unity of the church membership. Discipline of members should be corporately understood and accepted as it protects the integrity and unity of the church. 6. The goal of membership is not accumulation of numbers, but the spiritual development of the Christian constituency. Persons 16 years of age and older may become adult members. a. They acknowledge that the Bible is God’s Word, and that it alone reveals how to receive eternal life. b. They have experienced the forgiveness of sins through Jesus Christ. c. They are determined to grow in Christ and live in obedience to Christ. d. They have been baptized, or are willing to be baptized as soon as is convenient. e. They are willing to be governed by the church Discipline. f. They are willing to give of their time, abilities, and resources to support the various church interests, according to their ability. Persons age 9 through 15 may join as student members. c. They are determined to grow as a Christian and live in obedience to Christ. Student members are not eligible to vote in church elections. Each church may determine the procedure for accepting qualified persons into membership. It is important that new members and the congregation bond. Thus, the church should find a satisfactory way to communicate to its entire body the favorable answers to the following questions. As a church, we believe in the deity of Jesus Christ, the regeneration of the soul, a wholly surrendered and Spirit-filled life, and growth in grace and knowledge of the truth. We believe that there must be perseverance in Christian living and faithfulness in Christian witness to promote harmony in our relationship with the Savior. a. Do you believe the Bible to be the Word of God and that therein only is revealed the knowledge of the way of salvation? b. Have you asked God to forgive you your sins, and do you now believe that he accepts you as his child? c. Are you determined by the grace of God to follow Christ, renouncing the world and all ungodliness, seeking to live a life of holiness and devotion to God and his cause? d. Are you willing to be governed by our church Discipline, and are you willing to be placed under the authority of the local church? e. Are you willing to give of your time, talent, and means to the support of the various interests of this church according to your ability? f. Have you received water baptism? If not, are you willing to be baptized at your earliest convenience? c. Do you promise to attend the services of the church and to read the Bible and pray, so that you may become more and more like Jesus? d. Have you received water baptism? If not, are you willing to be baptized? The local board may approve a letter of transfer to another United Brethren church. Upon completion of the transfer, the person’s name shall be removed from the roll. When members desire to withdraw from the church, they may be given a letter of withdrawal by the local board. When appropriate, this letter may be accompanied by a statement of recommendation to a specific church, regardless of denomination. 1. To insure an active and accurate membership, each local church is encouraged to periodically revise its membership roll. It is recommended that every church revise its membership role in the year prior to the US National Conference. a. The local board has not known the person’s location for the past one year, and the local board determines that sufficient attempts have been made to locate the person. b. A member’s lifestyle, conduct, or doctrine violate the commitment agreed to in becoming a member. This action can be taken only if attempts to restore, correct, or reconcile the person do not succeed. 3. Upon reaching age 16, youth may be received into adult membership by meeting the qualifications for adult membership. No youth shall remain on the student roll after age 15. The student roll should be corrected annually. Applicants to Global Ministries must be current members of the Church of the United Brethren in Christ, USA. In the case of married couples applying for endorsed status, at least one must be a current member. All are expected to maintain their membership. However, dual membership is permitted should missionaries find church membership in their place of ministry to be either necessary or advantageous.